Today was our rest day. We woke at about 8 and staggered out for breakfast. Julian wanted a pizza (well, he is on holiday) and I ate porridge which was really good. After breakfast we went for a walk in Chhomrong. We are at the higher southern end and the rest of the village spreads out north and downwards. In the past few days we have seen several German bakeries and this morning we had a second breakfast of Danish pasteries and chocolate buns. There were some nice lodges at that end of the village and so when we come back down I think we will stay in one of those. Walking back to our lodge Julian had trouble going up the stone steps again. 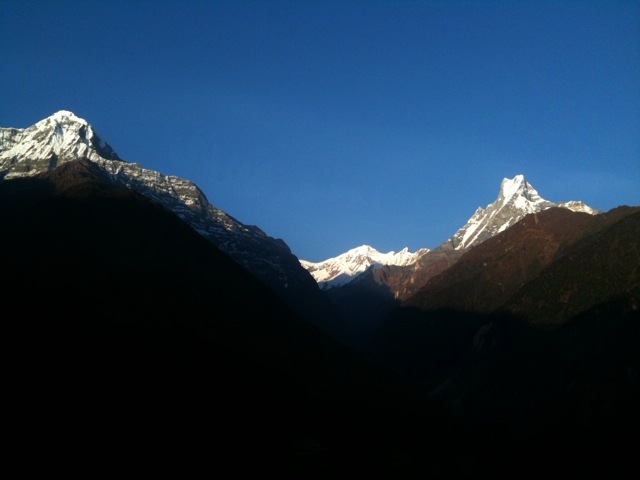 I’m beginning to have doubts that we will make it to Annapurna Base Camp. I can’t keep prodding him along like the donkeys that we are seeing everyday. It’s not much fun for either of us. We skipped lunch and in the afternoon Julian played poker dice with Narayan. They are getting on like a house on fire. I planned for us to have a shower in the late afternoon but unfortunately two other guests got in before us and despite it being only 3:30, there was no hot water left. We had a freezing cold shower again and then got straight into our sleeping bags to get warm. I listened to a podcast of the “News Quiz” from Radio 4 (how many other people can say they’ve listened to the News Quiz while in a lodge in the Himalaya?!) and then we went to sleep. This evening we had a nice meal and chatted to two great Germans, Bruno and Matthius. Their English, of course, was brilliant and we had many jokes. Julian asked them lots of his pre-prepared English questions and then he taught them some Japanese. He thoroughly enjoyed himself listening to their pronunciation. So the day ended well. We are hearing stories that the lodges further up the trail are filling up. Our porter is phoning ahead to see if he can book a room in Bamboo (2,310). If he can’t we may have an easy day and just trek to to Sinuwa (2,360) and then leapfrog Bamboo the next day and go for Deurali (3,200). Hopefully there won’t be too much up and down from now on. Another thing we have been hearing from people coming down is that last week the weather was really bad all the way up. Some days it rained and everyday it was cloudy so that the trekkers couldn’t see the mountains as they trekked up. That must have been pretty demoralising. 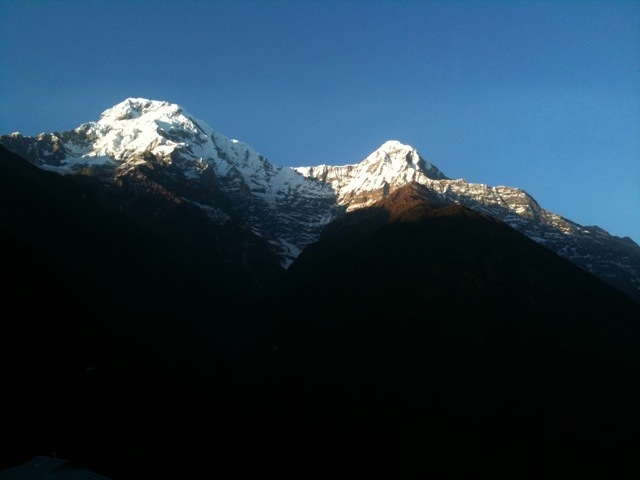 There was also snow up there with 5 or 6 inches at Annapurna Base Camp. It could be cold. I’m hoping that the recent milder weather will have melted some of that snow. It seems that those 4 days we waited in Pokhara were a really good idea. 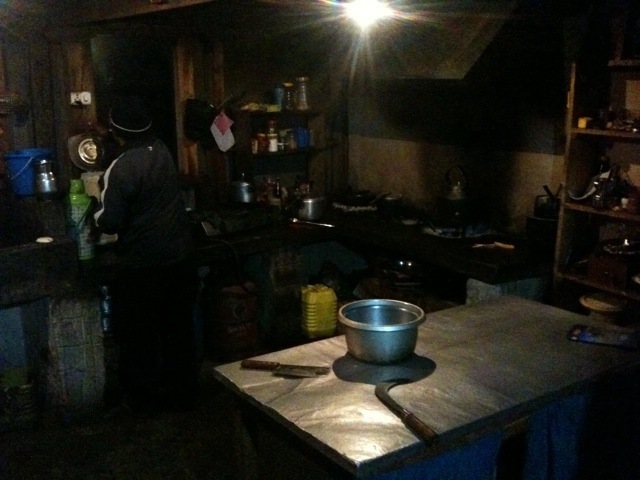 This is a kitchen in one of the lodges. 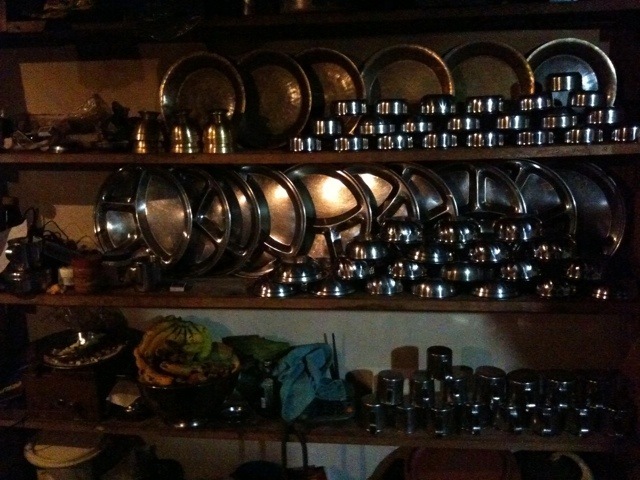 Most of the crockery is either metal or plastic, rarely china.